There are just two vegetarian thali restaurants in Mumbai that I’m willing to accept eating at – Thakker Bhojnalay and Mani’s Lunch Home. Juss by Sindhful is going to be the third on my list. All three have the same things in common – the food is simple, freshly prepared and most importantly, tasty. My knowledge of Sindhi food, however, is meagre. The original Kailash Parbhat, the bastion of Sindhi food, is minutes away from my house, but Kailash is more known for their chaats and their snacks rather than their meals. I liked Juss not because I could tell whether they were being true to tradition but because almost everything I ate was pleasing. However, I did take a Sindhi friend Seema Wazir nee Motwani along with her husband Ravi to act as my guides to act the Voice of Authority. As it turns out, they’re already regular customers of Sindhful, the older, meat and vegetarian, home delivery and take-away service. 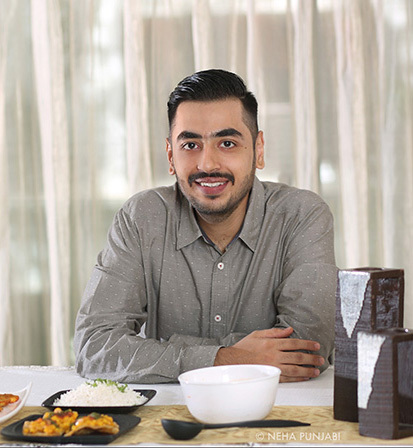 Both establishments are run by a very young and earnest Sannat Ahuja, who with no background in the restaurant business is well on his way to bringing Sindhi cuisine to the forefront of Mumbai food. Juss, explains Ahuja, is the word his grandmother used to explain the magic in someone hands. It’s a concept we all understand; it’s more than just skill, training or experience, it’s the innate ability to know when something is cooked just right. At Juss, almost everything is cooked just right. Tikra, the spiced, crunchy phulko bits (India’s answer to tortilla chips?) were rather addictive and I couldn’t resist munching them through the meal. The first starter, the pakwan chaat, where the famous Sindhi bread was topped with chole and sweet and spicy chutneys was polished off quickly. The crispy, heart-shaped bheeyan ji tikki topped with crispy lotus stem coated in a sweet-piquant sauce was even better. There was flavour, there was texture, there was a sense of the familiar tikki and the unusualness of the taste. It was something that you would want to return for. And his customers are returning. Looking at the other tables in the tiny restaurant I could tell that these were not first-time customers (who, much to the surprise of all three of us, were rather well-dressed for a Bandra/ Khar restaurant); most knew what they wanted and had few queries for the waiters. Like most other thalis in the city; the one at Juss is also unlimited, but the options are fixed. For me, everything was new and everything tasted freshly made. The Sindhi curry had a slight tang, but the daran ji bhaji had a distinct sourness to it, the aloo tuk in Seema’s opinion was acceptably, but not perfectly, crispy. I loved the thick, heavy sai bhaji and dutifully ate it with the aloo tuk and bhuga chawal as instructed. I was not overwhelmed by the desserts, but I suspect that was because of my personal tastes and not any fault in the preparation. The dyammu (gulab jamuns), for instance, were made in the traditional Sindhi style – softer than the ones normally sold at general mithai shops. The singhar ji mithai was a soft barfi served in a bowl oozing fat, but not too sweet: I prefer it drier and cut in squares. Only two dishes disappointed; the crispy seeyal which both Seema and Ravi found to be too dry. I found it too cumbersome and pulling each slice of bread caused the filing to scatter. In comparison to the bheeyan ji tikki, I found the mashed potato pattice to be lifeless and devoid of flavour, and the channa dal stuffing made it dry and grainy. But these were two minor faults, in a meal otherwise deserving of superlatives. Juss, no doubt, will quickly be ‘discovered’ and, sooner than later, be included in ‘Best of’ lists. It will be one of those rare occasions where a restaurant merits inclusion based on merit and not on hype.